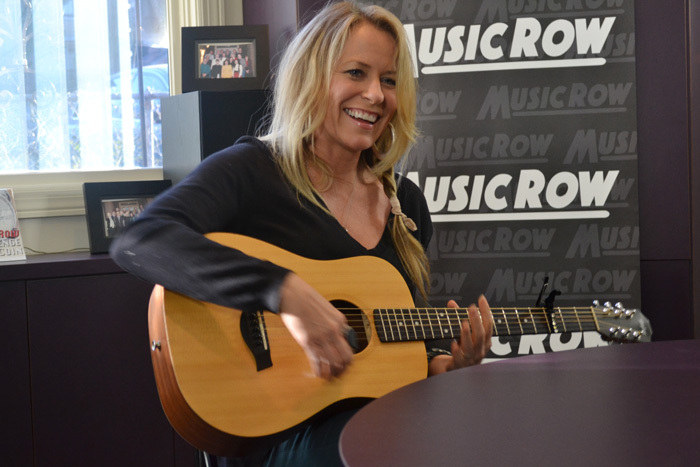 Deana Carter visited the MusicRow office yesterday (Feb. 27) to perform songs from her album Southern Way of Life (Little Nugget Records). After a six-year hiatus, Carter returns with a considerable arsenal of new songs, all wrapped in her distinctive, honeyed vocal. Carter has lived in Los Angeles over the past few years, writing songs for television and films. She still managed to launch a No. 1 song on the Country charts, with “You And Tequila.” “Alicia Pruitt called me and I got signed to Warner/Chappell [Music Publishing], and we did nearly three years of publishing and songwriting,” she says. “You and Tequila” was co-written with Matraca Berg and recorded by Kenny Chesney and Grace Potter. Southern Way of Life is released on her own Little Nugget Records, which is a tribute to Nugget Records, the independent label imprint her father, Fred Carter, Jr., once owned. She followed up with the clever “I Know Better,” which was co-written with Anne Preven in Los Angeles. “About half the album was written in Los Angeles, and half was written in Nashville,” says Carter. She reports that she has enough song material for two additional albums.